Infolinks is one of the most popular in-textual advertising programs that help to monetize your website and start making money. It is indeed the #1 alternative to Google AdSense that provides quality service to its publishers. Do you know that you can easily add Infolinks to your blogger site and start earning fairly decent money from it? 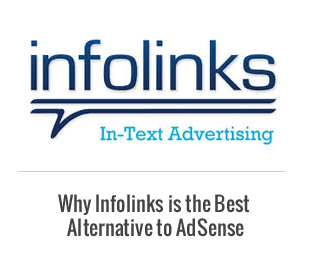 Today in this article, we will show you Why Infolinks is the Best Alternative to AdSense? Infolinks is leading in-textual advertising program that is solely made for bloggers and webmasters to monetize their text content with relevant link based ads to earn from their website. 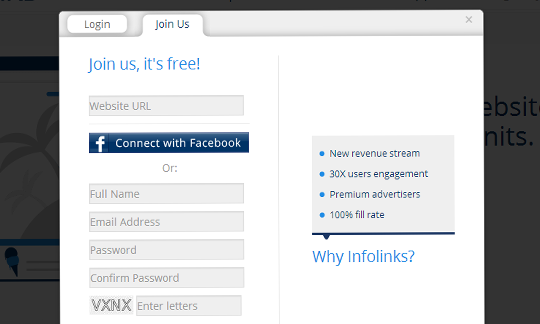 Infolinks is a FREE-TO-USE platform that handles all of the advertisers on its own, all you have to do is to install the Infolinks widget on your site and start counting money that your site is making. Infolinks team maintains a strong relationship with its publisher by organizing giveaways on festive occasions. Infolinks offers CPC (Cost per click) program which means you are making money for each and every link ad click on your site. The rates of earning various from country to country, however a click from USA and European countries always gives decent earning. Why Infolinks is Best Alternative to AdSense? Easy Approval: Getting approved at Infolinks is fairly easy then at Google AdSense as 90% accounts get approved in the first go. Compatible with AdSense: Even if you’re using AdSense, you can still use Infolinks with it just to get additional revenue from your site. Decent Earning: Infolinks pays a decent amount of money on each ad click that your site receives, Sometimes they pay for impressions too on ads. They don’t pay as much as AdSense does but it is surely more than any other Ad network on the internet. Every Thing for FREE: You get this for absolutely FREE, no need to pay any registration fee or any hidden charges with free advertising host. The very first thing you need to do is to sign up for an Infolinks account. During registration you have to provide your all personal information like Name, Email, Password and etc so make sure you provide them accurate details as well. Once you have successfully submitted your application it will take around 24 hours to get a responsive from Infolinks team confirming whether your account is approved or you need more improvement to be a publisher. (However, mostly Infolinks approves 90% accounts on first attempt). If you got an approval, login to your Infolinks account and go to Integrate Tab. 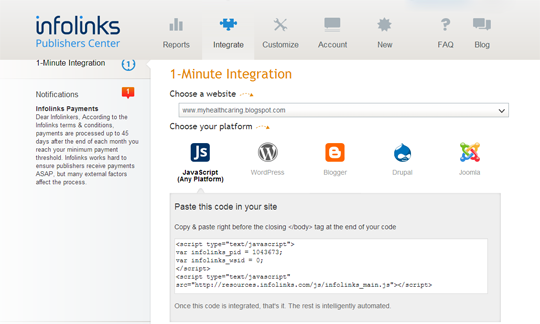 Now select the integration code as seen in the screenshot below and paste it before </body> ending tag. If you are using a specific platform like blogger then, go to Template >> Edit HTML >> Search for </body> and just above it paste the code. However, if you are using WordPress download and activate Infolinks plugin for WordPress and that’s all. You have successfully integrated Infolinks to your website. InText Link Ads: InText Ads are contextual advertising ads. Infolinks scans your content carefully and automatically select relevant keywords and double underline them. Whenever a mouse is placed on those links an ad will pop out matching to the keyword. InTag Link Ads: An InTag ad automatically calculates most valuable keywords across your website and display's them in a horizontal link tag cloud. You can control its placement or can depend upon automatic Infolinks placement. InFrame Ads: InFrame displays picture advertisements on screen margins adjusting to your layout. It appears on widescreen monitors and always appears on extra spaces. It doesn't overlap on your content so your reader always gets a user friendly experience. InFold Ads: Whenever you user searches for something on your site using the search widget present on your site. Infolinks will display most relevant ads towards the bottom of your screen which will provide a real boost to your revenue. You can read more about inFold ads on infolinks website. We hope this article has helped you understand that why Infolinks in best alternative to AdSense so what are you waiting for register at Infolinks today and start earning what you always dreamed for. Are you a Infolinks publisher feel free to share your experience in the comments below. Hi, 1 question appearing . . . . Which is better between these both : Infolinks & Chitika ? Infolinks is one of the best way I monetize my blog these days and am really see a lot of improvement day by day... Am just relaxed using them,, they are truly the best..